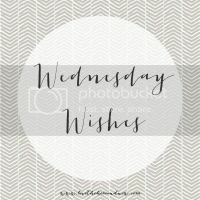 I'm linking up again with Anne this week for Wednesday Wishes and I know I warned last week that my wishes this week would be more superficial, but I ventured from that route and in its place is what's listed below.. Flexibility is key. 1. I hope I get cast in the big Murder Mystery performance show in mid-August at a relatively local resort of sorts. As part of the Murder Mystery troupe, it's based off characters needed and availability, so I'm not able to do every show that the Mystery Troupe puts on. The experience is a blast, since the acting is both scripted and impromptu and interactive with the guests. You never know what the guests will say, so it keeps you on your toes. If you've never been to a mystery dinner event, you must add it to your bucket list to experience. 3. I wish I had more time to devote to studying/re-learning Italian. I'm so excited to be going to Rome for a few days in November with Kiki la Rue. I really need to get some audio CDs, so I can learn while I'm trekking to some great places this summer. I have some incredible plans in the works and it all starts in like 12 days! 4. I wish my TO DO list would do itself. I don't think any further explanation is needed. 5. I wish this Whole 30 diet would work for my Rosacea. I'm on day 21 and unfortunately, I don't see much of an improvement. The good news is I've lost a dress size and 10 lbs. Is it bad to wish for 5 more? Either way, I'm adding it to the wish list. I'm missing food (and STARBUCKS like woah, off the charts) but I really am feeling great. 6. I wish for a few hours to catch up on my DVR. There are some shoes that I'm dying to finish up Chicago Fire? Get on my TV screen, while I eat some Kale chips. Speaking of Chicago, I've only been to the outskirts of Schaumberg, for the Miss Illinois pageant to support my best friend, Ashley (she's the same one who went to Italy with me in '06) so I would really love to visit and experience the Windy City. I think I've met my Wishing Quota, since I usually only I do three wishes...oops...that's why I teach English and not Math. Where to begin??? The Mystery Troupe sounds like so much fun!!! As an actress and a guest it would be a ball. Ita;y? SO jealous....love it there; it's so beautiful and let's not forget the food. Funny....my To DO list does't do itself either. Are we doing something wrong? Thanks for co-hosting with me! The to do list...ugh. I wish this same thing! !